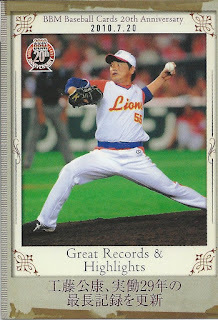 For the first time, there are no gaps in the card numbering to account for the hologram inserts. 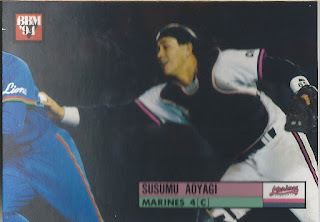 The player hologram cards were unnumbered with blank backs. 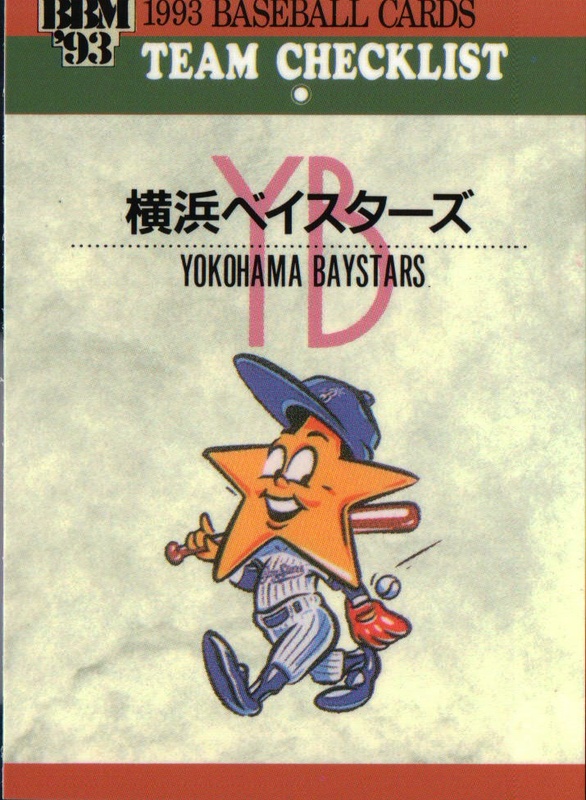 There are 12 (one from each team) and feature the player's image superimposed over his home ballpark. 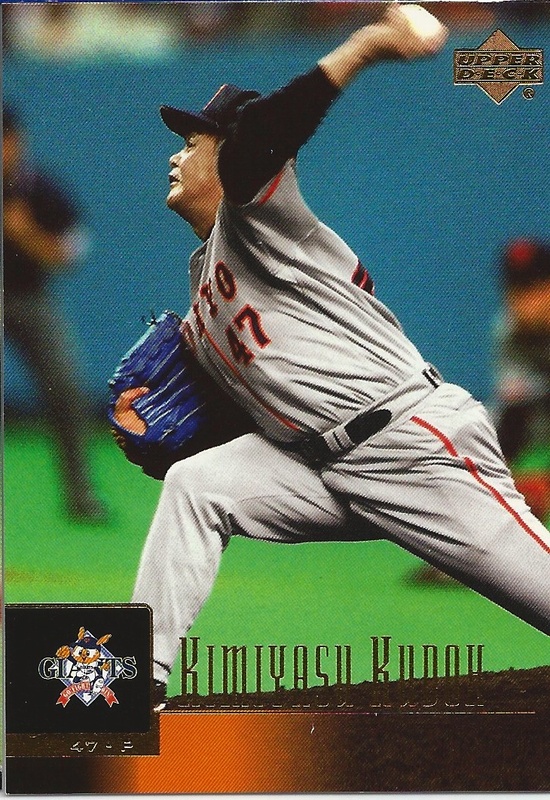 What's kind of odd is that the ballpark image is oriented horizontally while the player's image is oriented vertically. The Slugger insert set featured 24 cards depicting two hitters from each team. 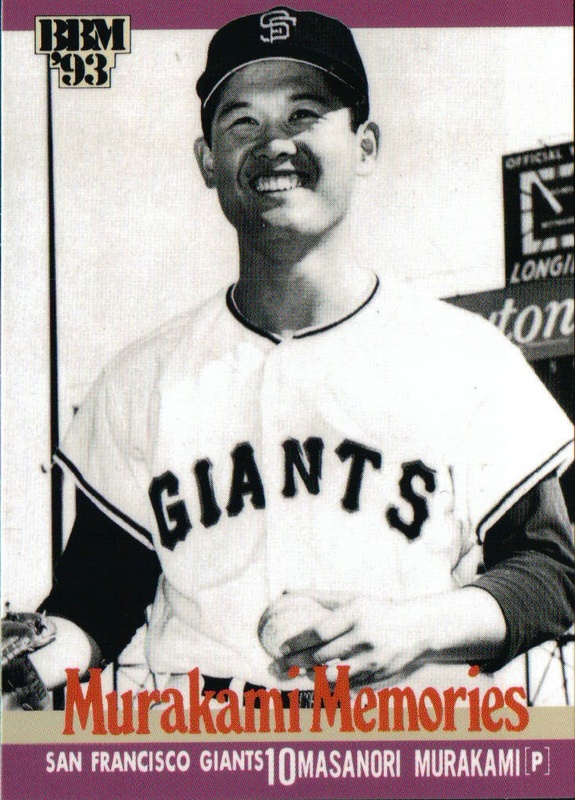 The Nostalgic Stars subset featured 10 foreign players from the 1950's to the 1990's - Gene Bacque, Chico Barbon, Don Blasingame, Warren Cromartie, Leon Lee, Leron Lee, John Sipin, Daryl Spencer, Joe Stanka and Boomer Wells. 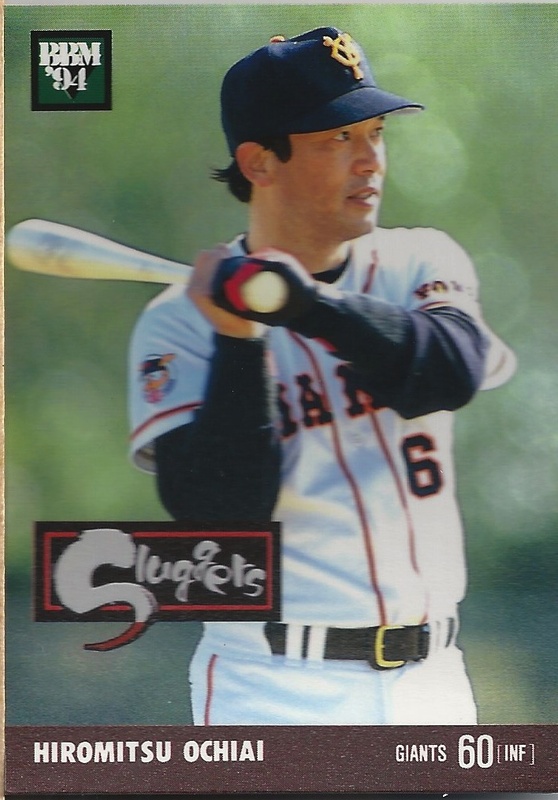 Wells is an interesting inclusion considering that he appeared in both the 1991 and 1992 BBM sets - he's the only one of the 40 players featured in the Nostaglic Stars subsets from 1991 through 1994 whose career ended after BBM started making sets. 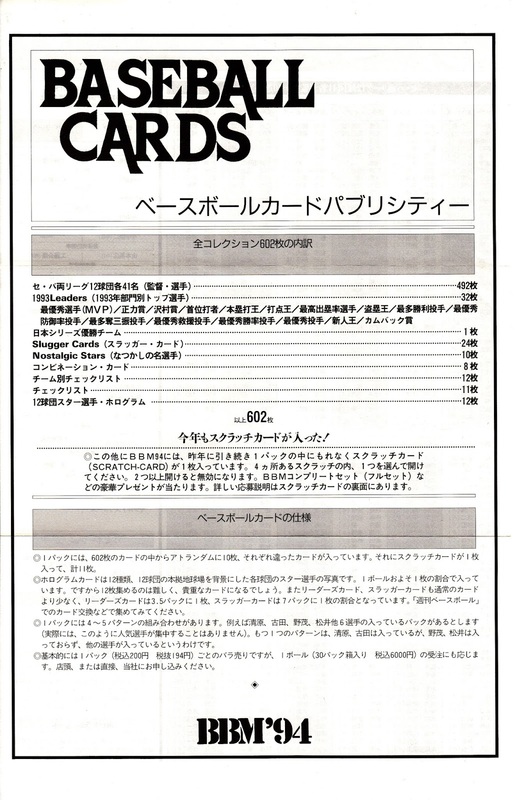 For the first time, the Combination Cards included pairings of players from different teams. 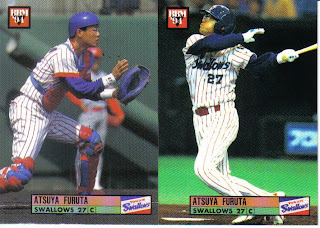 Like the 1992 edition, each card had its own title - Hama Heroes, Swallows Swingers, Fighting Fighters, Former Teammates, etc. 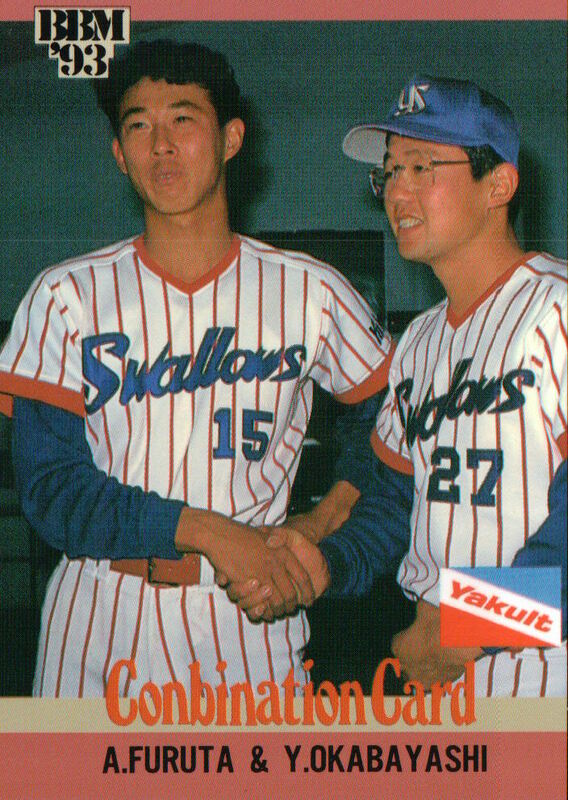 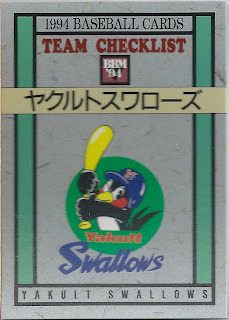 For the 1994 season, the Swallows changed their hat logo from the monochrome "YS" insignia they had used since they changed their name from the Yakult Atoms for the 1974 season to the two-tone insignia that they continue to use today. 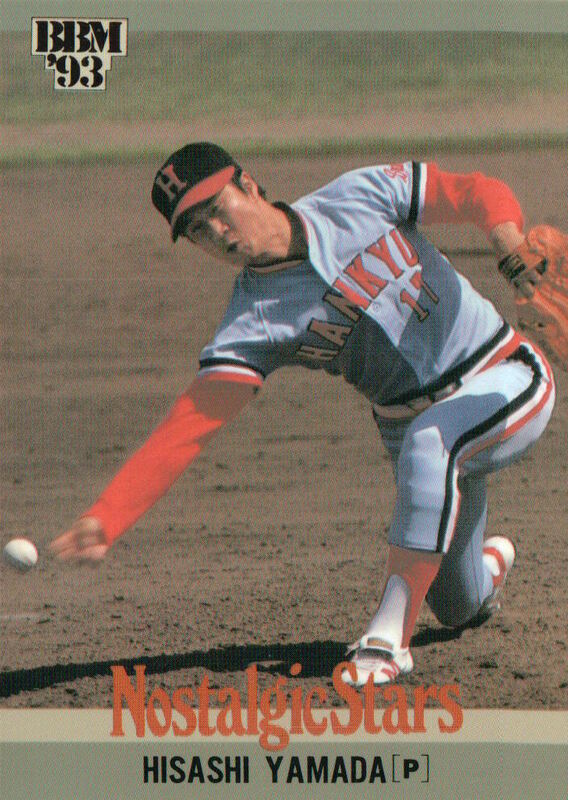 They also made a slight uniform change, removing a red cuff at the end of the jersey sleeve. BBM used this as the excuse to replace the Swallows cards 1-42 with a "Late Series" edition (Cards 567-608) showing the players all wearing the new cap and uniform. 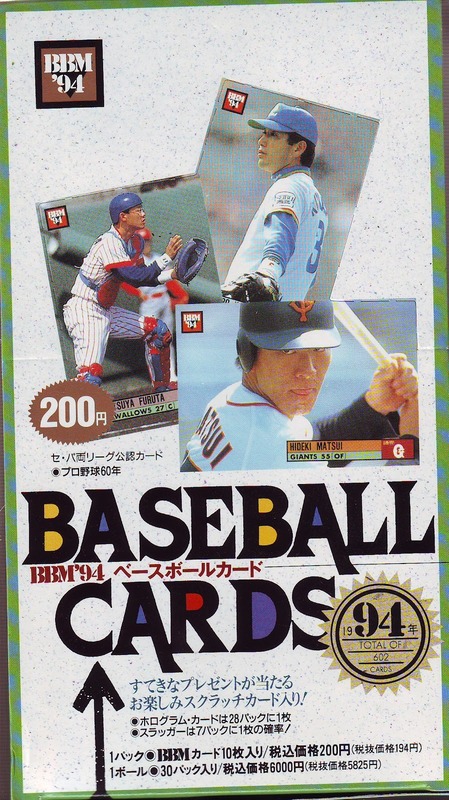 The 1994 set was the last time BBM had a card of "Ichiro Suzuki". 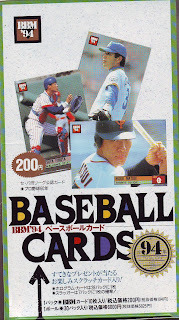 Starting with the 1994 All Star set, he has simply been "Ichiro". 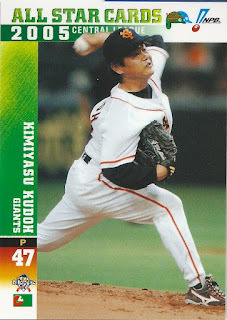 Anyway, this post is about Kudoh and not me. 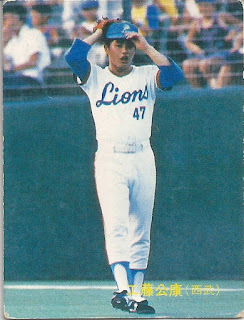 Kudoh was drafted by the Seibu Lions in November of 1981 and debuted with them the following season. 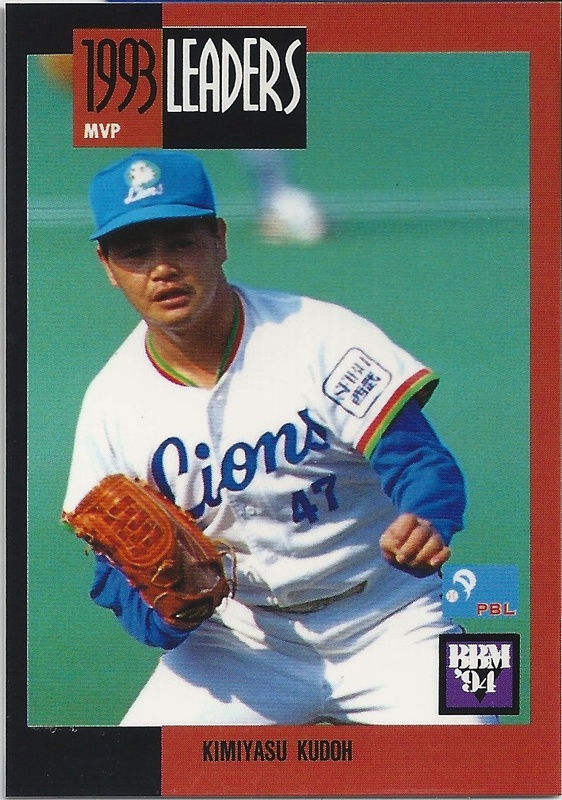 It would be a very good time to be a Seibu Lion - they would make the Japan Series 11 of the 13 seasons that Kudoh spent in Saitama (through 1994), winning 8 of them. 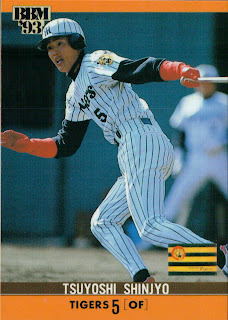 Following the 1994 season, he left as a free agent to join the Fukuoka Daiei Hawks (reuniting with former Lion teammate Koji Akiyama who had joined the Hawks the previous year). 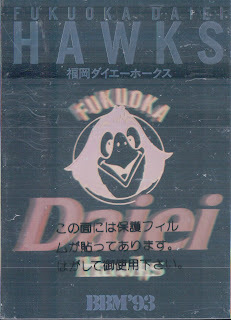 He spent the next five seasons with them, winning another Japan Series in his final season in a Hawks uniform, 1999. He then joined the Yomiuri Giants (his favorite team growing up), reuniting with yet another former Lions teammate Kazuhiro Kiyohara. 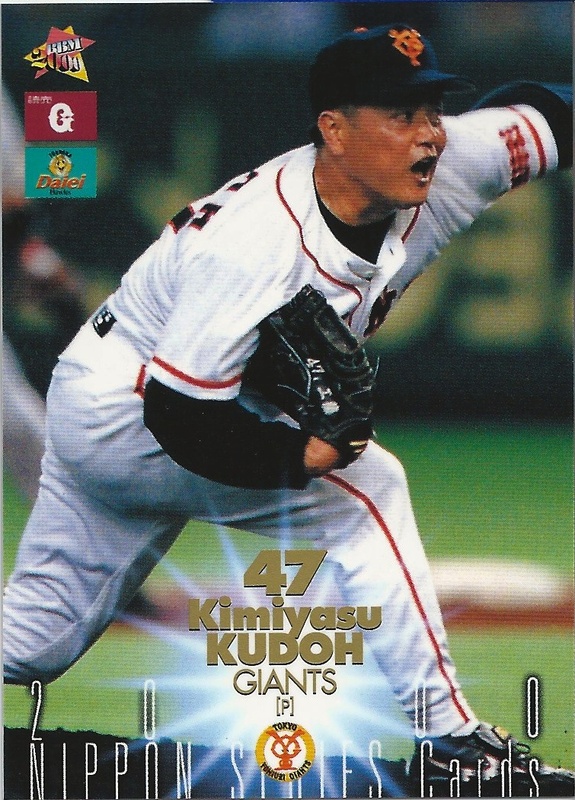 He won two more Japan Series with the Giants - 2000 (against the Hawks team he had just left) and 2002 (against his other former team the Lions). 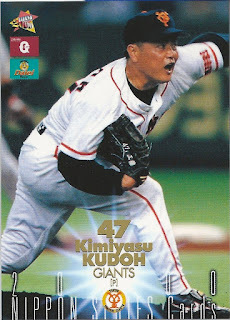 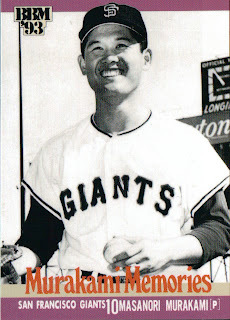 He remained with the Giants until the 2007 season when he joined the Yokohama Baystars. After three years with the Baystars he returned to the Lions for what turned out to be his final season in 2010. 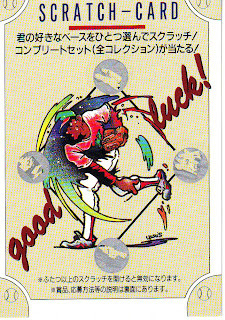 Kudoh finished his career with a record of 224-142. Although he never won the Sawamura Award, he was named Pacific League MVP twice - in 1993 and 1999 and Best Pitcher in 2000. 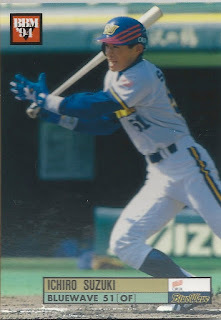 He also won three Gold Gloves (1994, 1995, 2000) and made three Best 9 teams (1987, 1993, 2000). I was kind of surprised that in a 29 year career, he only made the All Star team 10 times - 1986-1987, 1991, 1993, 1995, 1997, 1999-2000, 2004-2005. 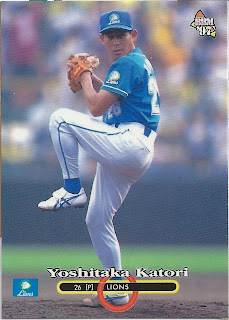 He ultimately ended up pitching in 14 Nippon Series with three different teams, winning 11 times. 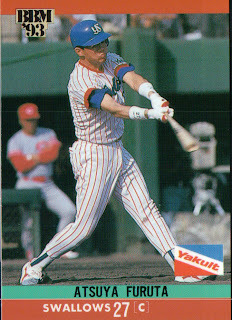 He was the MVP of the Series in 1986 and 1987. 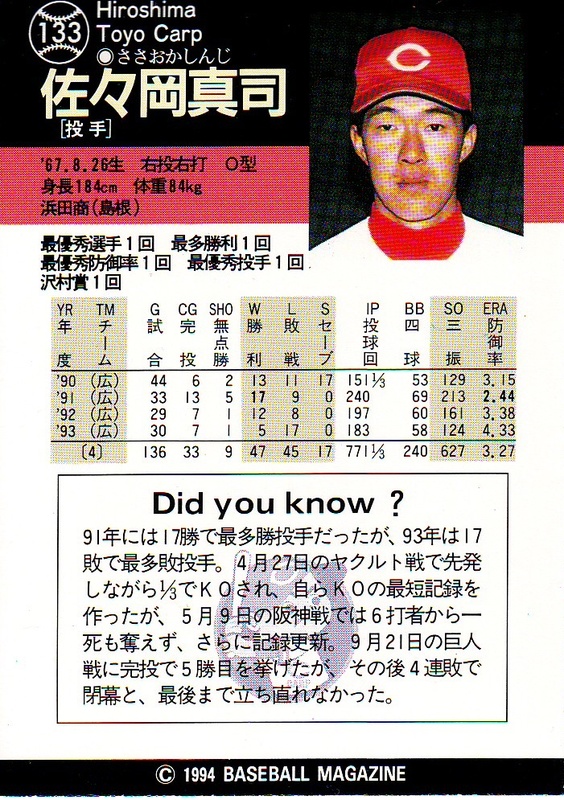 He also won an "Outstanding Player" award in the 1991 and 1999 Series. 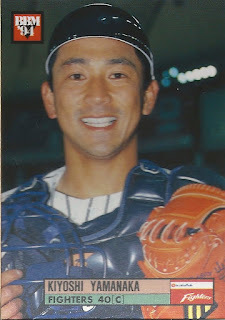 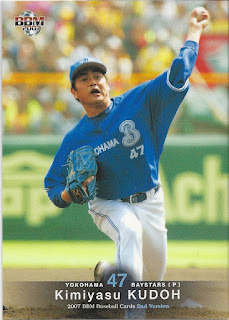 In 2009, he broke Katsuya Nomura's record by appearing in his 28th NBP season and extended that record in 2010 to 29 seasons. A little late this week due to the holiday. 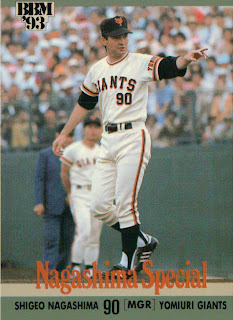 Hope everyone who celebrates Christmas had a merry one and everyone else had a good day as well. 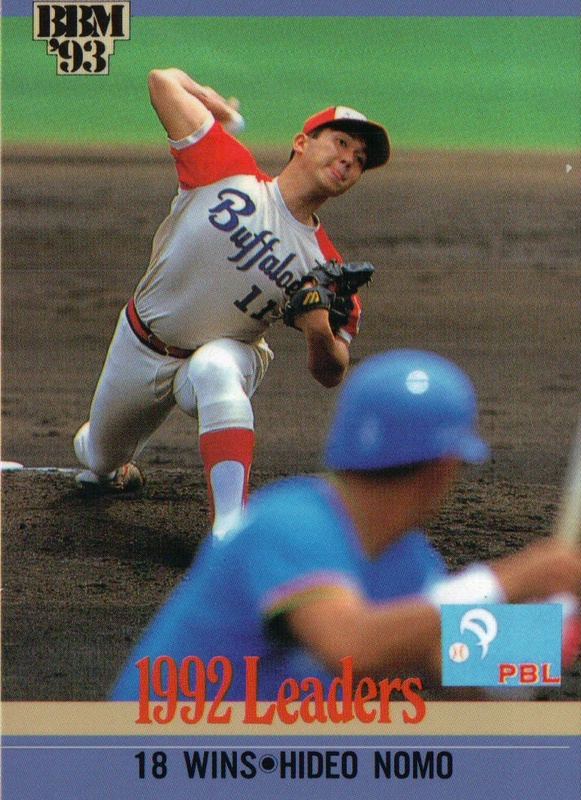 My first thought when I looked at this card was that it was a game action shot, but the more I looked at, the more I realized it wasn't. The guy who I originally took to be the third base coach is wearing a jacket and he's standing on third base. It looks like there's another Dragon's player or coach wearing a jacket in the outfield. And it looks kind of like some of the fans in the outfield are holding pieces of paper down towards the field for autographs. So I'm guessing this is spring training or something like it. 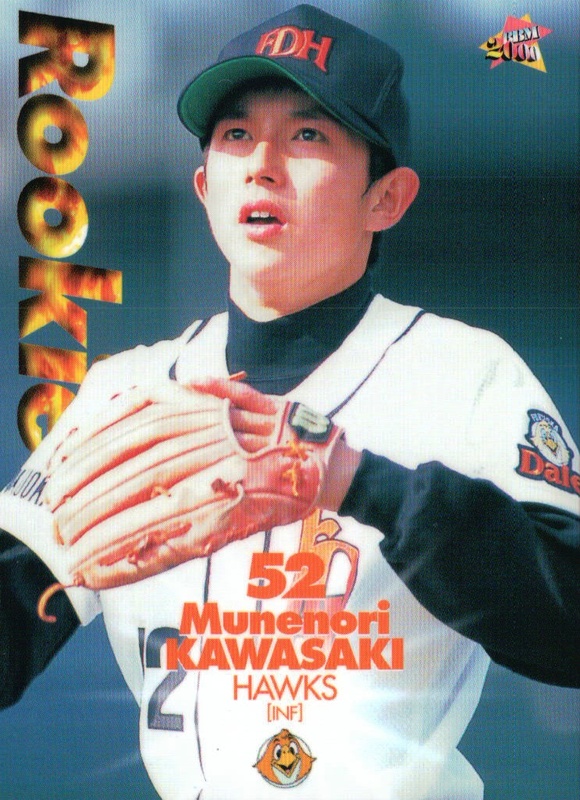 Another Hawk has flown away from Fukuoka as infielder Munenori Kawasaki signed a minor league deal with the Seattle Mariners last week. 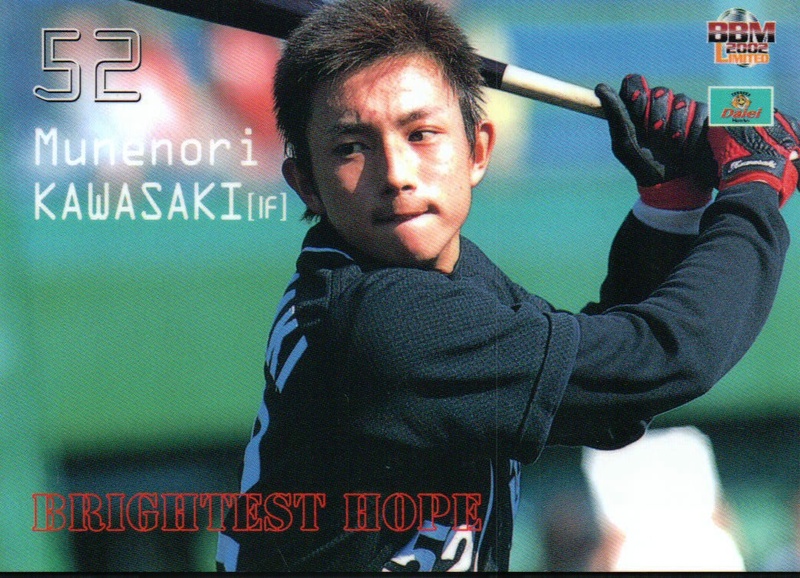 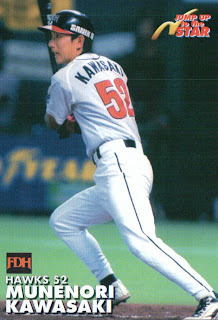 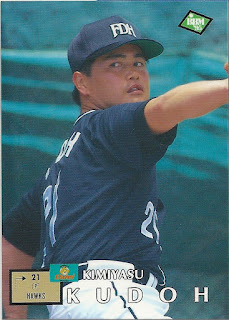 Kawasaki's rookie card is #291 from the 2000 BBM set. 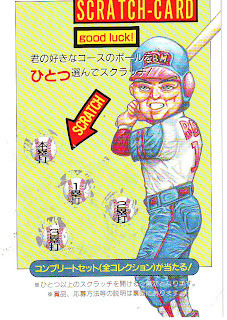 He didn't appear again in another of the main BBM sets until the 2003 1st Version set (#267). 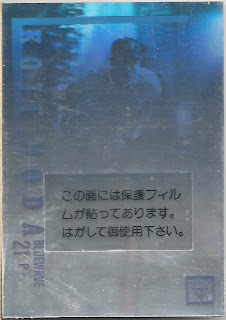 Since then, he's been included in each of the main BBM (1st & 2nd Version) sets. 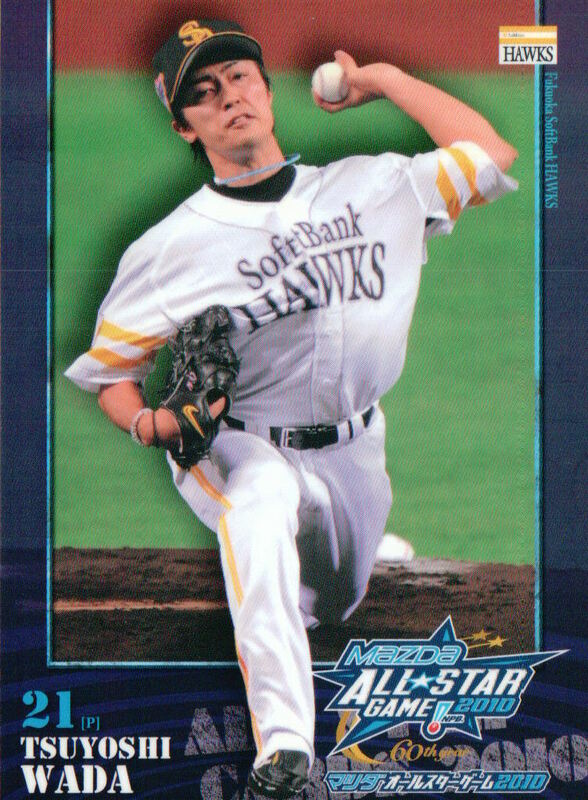 His first Calbee card was a 2003 "Jump Up To The Star" insert card (#J09) but his first "regular" Calbee card wasn't until 2004 (#006). He appears in the BBM All Star sets from 2004-2011 and the Nippon Series sets from 2003 and 2011. 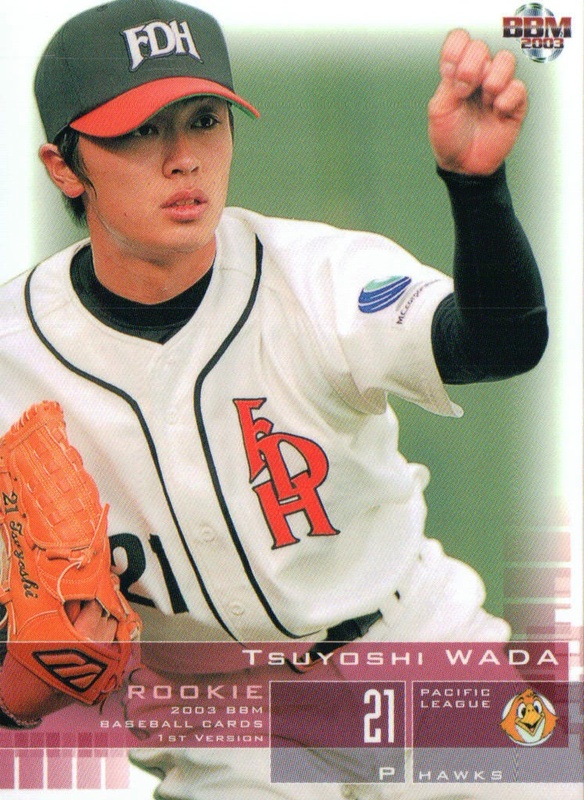 He played on the Japanese National Team for the 2006 and 2009 World Baseball Classics so he has a couple Upper Deck memorabilia cards from the 2006 team and a "Bowman Draft Picks WBC Prospects" card and associated parallel cards from the 2009 team. He also appears in the 2008 BBM Japan National Team set for the 2008 Olympic team. 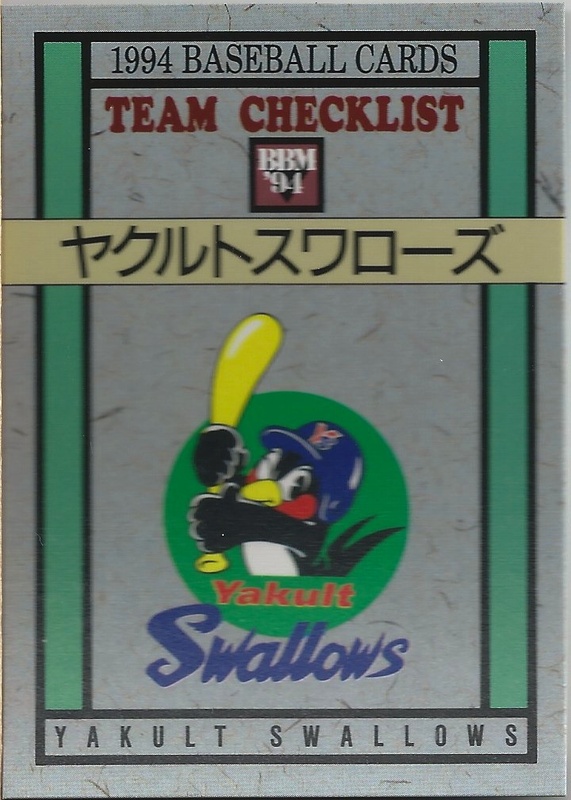 As usual, this is not a complete list, merely some of the highlight. 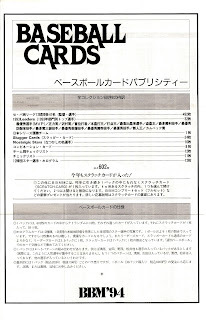 Check SportCardForum's Inventory Manager for a more comprehensive list. 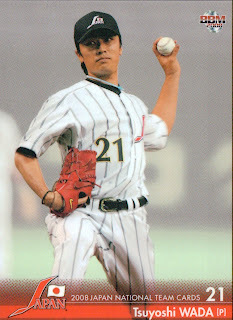 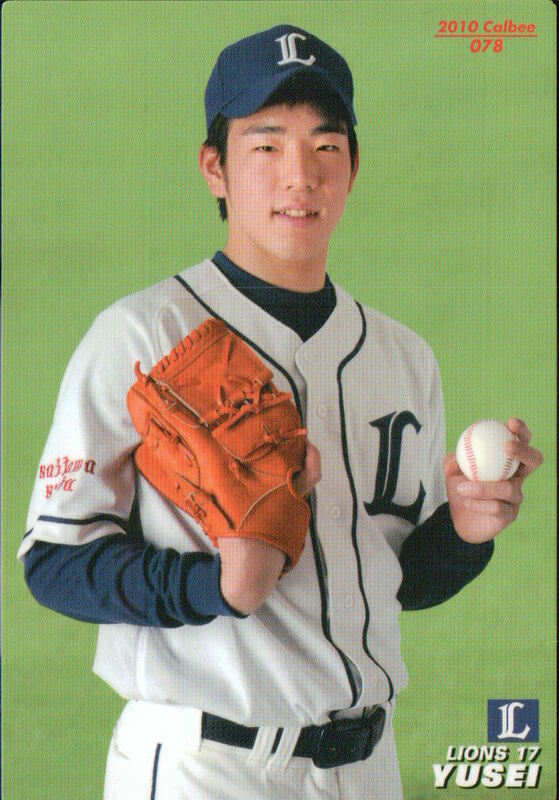 Last week former Fukuoka Softbank Hawk pitcher Tsuyoshi Wada signed a contract with the Baltimore Orioles. 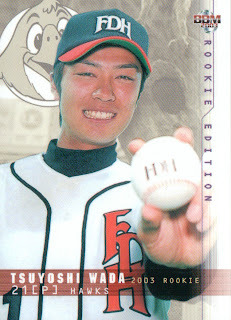 He had a draft pick card (#63) in the 2003 BBM Rookie Edition set. His BBM rookie card is #273 from the 2003 1st Version set. 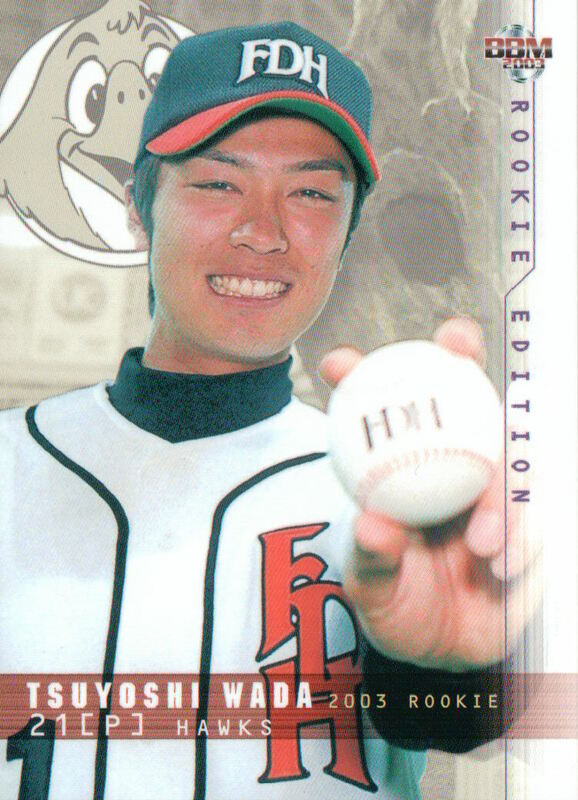 His Calbee rookie card is #146 from the 2003 set. 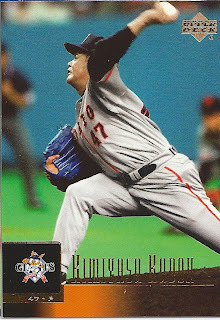 He's pretty much been in each BBM 1st and 2nd Version set since 2003. 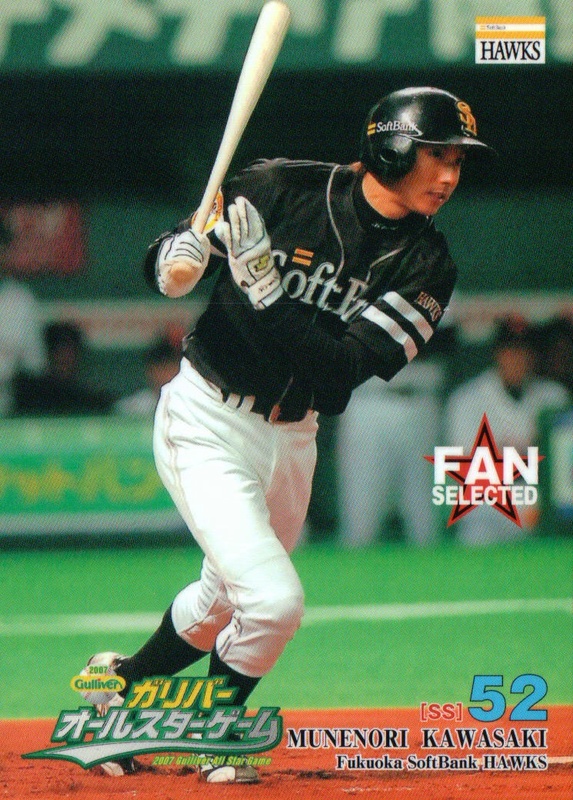 He appears in the BBM All Star sets from 2003, 2004, 2010 and 2011 and the Nippon Series sets from 2003 and 2011 (I'm assuming). 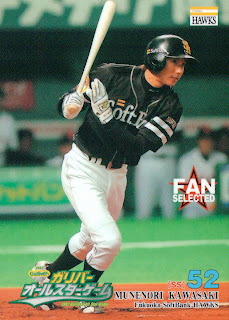 He played for Team Japan in the 2003 Asia Games and the 2008 Olympics so he appears in both BBM box sets for those teams. 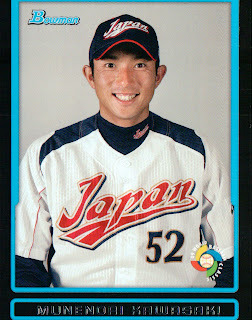 He did not take part in either World Baseball Classic so there are no Upper Deck or Topps cards for him. 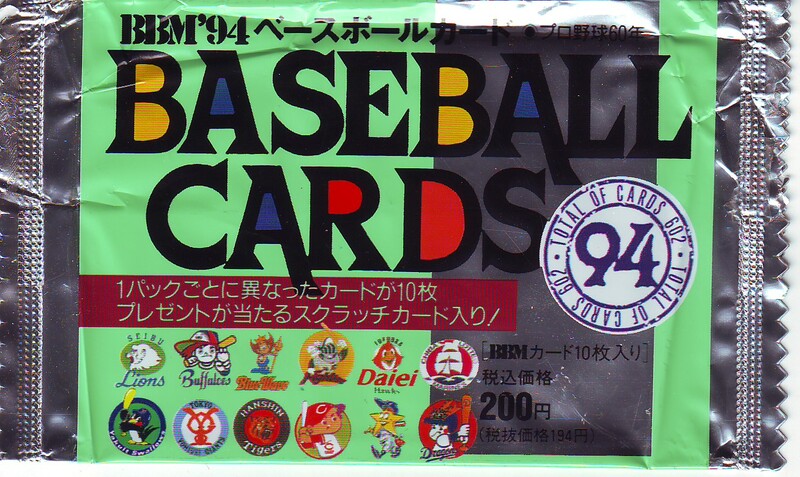 As always, this is not a comprehensive list, just some of the highlights. 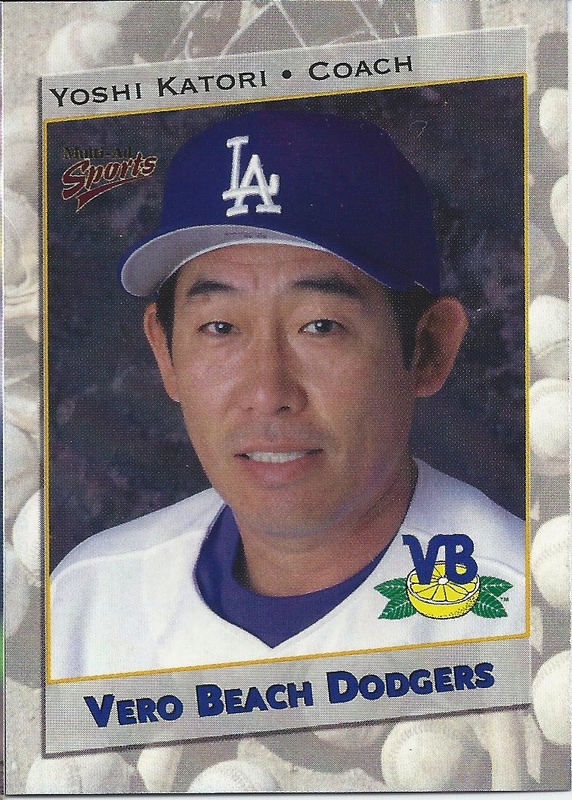 For a much more comprehensive list, check SportsCardForum's Inventory Manager and take advantage of all the hard work Jason's done in adding Japanese cards to their database. 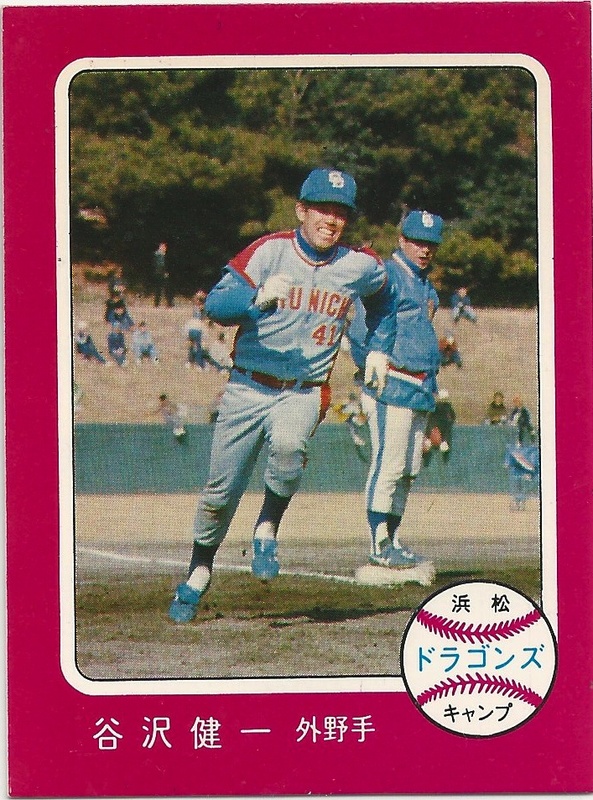 I'd been meaning to do a post about the Japanese players playing in foreign winter leagues this off-season but I simply haven't had time to do the research. 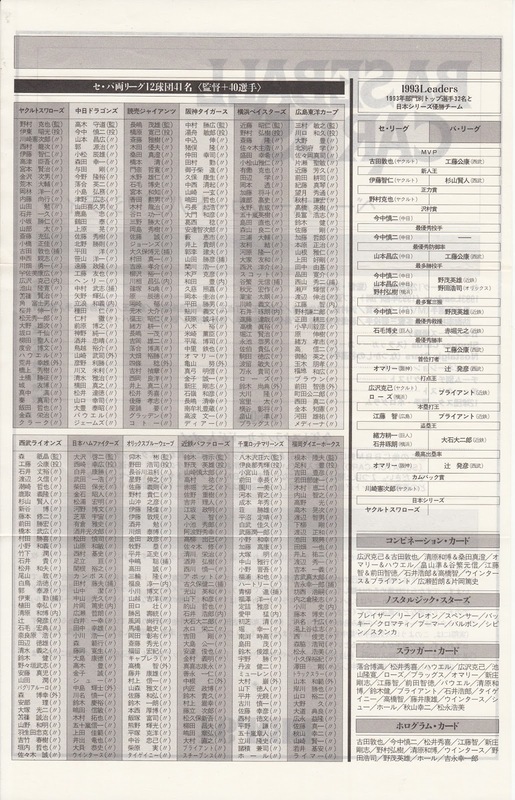 And since most of them are returning home before the end of the year, I probably won't bother now. I do want to point out, though, that the Australian Baseball League is having their first ever All Star Game this Wednesday. 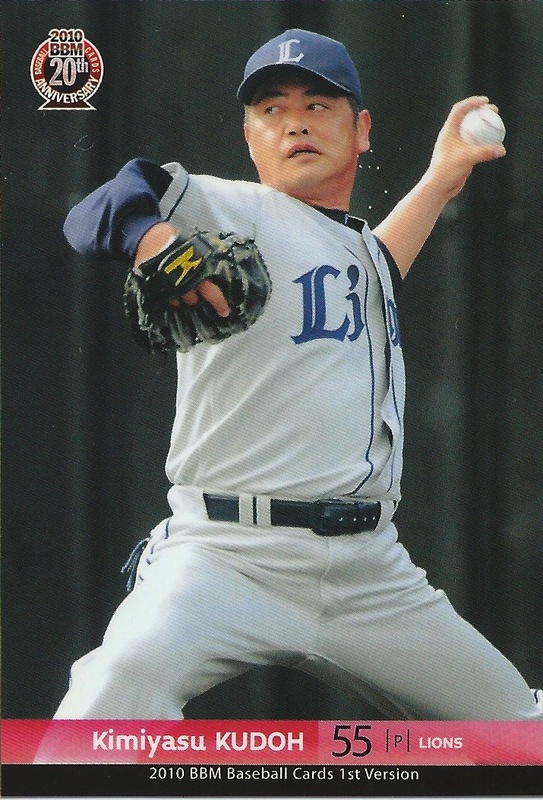 It will pit a team of Australian players against a team of international players, including several NPB players - Hiroshi Katayama of the Eagles; Kenta Imamiya, Ayatsugu Yamashita and Yohei Yanagawa of the Hawks; and Yusei Kikuchi and Fumikazu Kimura of the Lions. 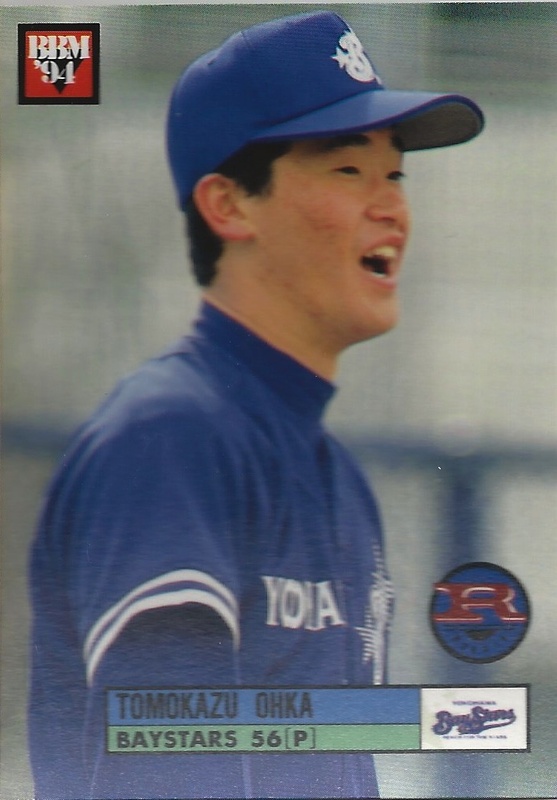 The rosters of the two teams also include former NBP players Chris Oxspring and Dae-Sung Koo (who I thought had retired). 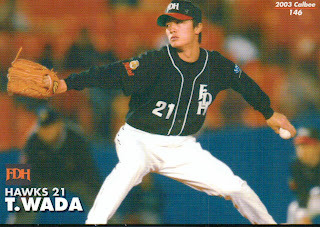 The game will be shown here in the States on the MLB Network Wednesday at 1 PM EST. 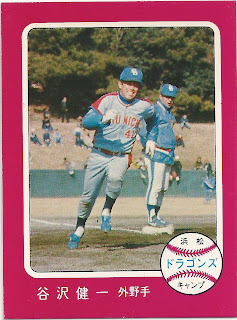 I'm probably stating the obvious here, but this quasi-1982 Topps card is not a legitimate issue but someone's home-brew card. 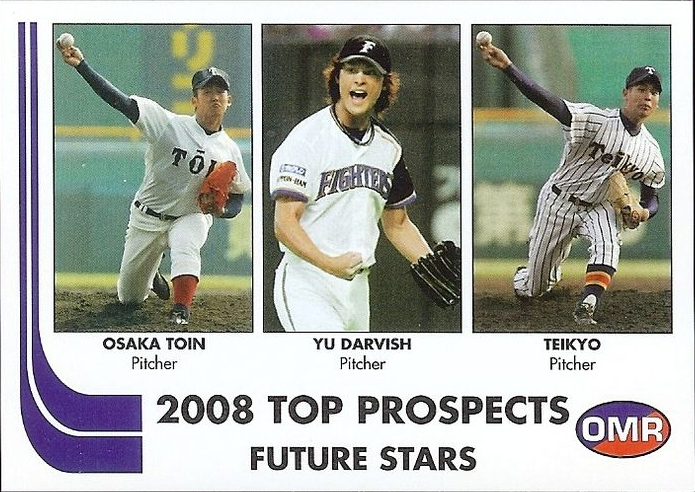 I especially like the addition of the other two pitchers to make it seem like this is a real "Top Prospect" card. 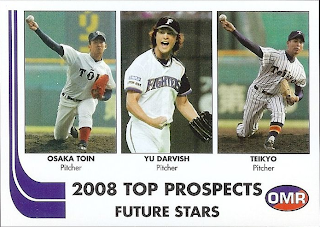 Not that the other two "prospects" have actual names, just the names of their teams - I'm guessing high school. 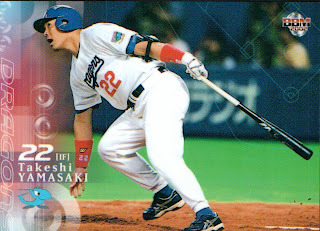 (Maybe I'm wrong and it's normal to have the player's name on the FRONT of the uniform.) 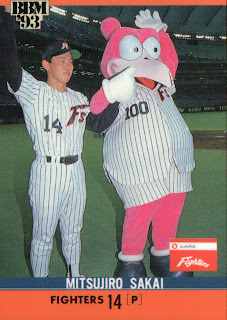 I'd be interested in what the back of the card looks like - although not interested enough to actually waste money on one. This was the last of the BBM sets to be issued as a factory set. It was also the first to feature full color backs including a head shot of the player. 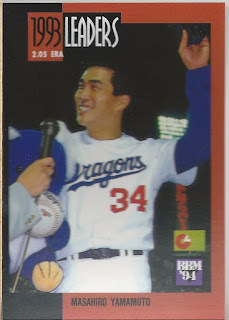 Although the set was not issued in two series, there are two numbers in the set reserved for the team logo holograms - #237 and #500. 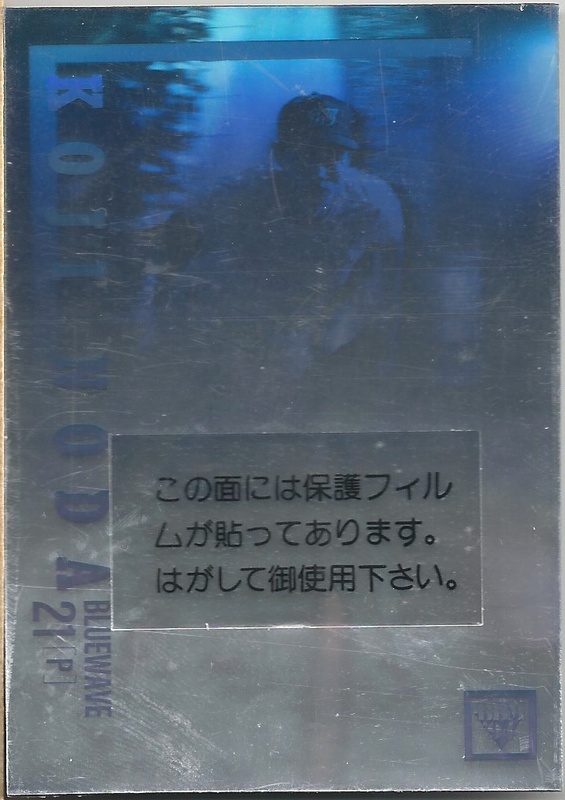 There is no indication on the holograms what their card number is however. 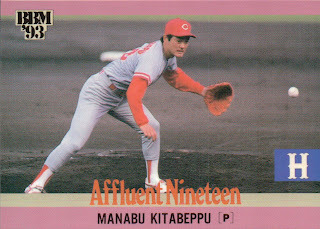 I'm not sure what the "Affluent Nineteen" subset is commemorating. 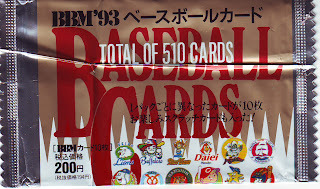 My first thought was that 19 cards meant it was a "Best 9" kind of group - maybe the highest paid player at each position in both leagues (including DH in the Pacific League). But there's six pitchers included, so that doesn't work. So I suspect that it's simply the highest paid 19 players, but that could be wrong too. 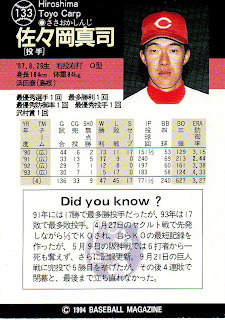 The players in the subset are Koji Akiyama, Katsuya Furuta, Tatsunori Hara, Ken Hirano, Katsumi Hirosawa, Takehiro Ikeyama, Hiromichi Ishige, Tsutomu Itoh, Taigen Kaku, Yoshitaka Katori, Manabu Kitabeppu, Kazuhiro Kiyohara, Norihiro Komada, Hideo Nomo, Hiromitsu Ochiai, Daijiro Ohishi, Masaki Saitoh, Hatsuhiko Tsuji and Hisanobu Watanabe. 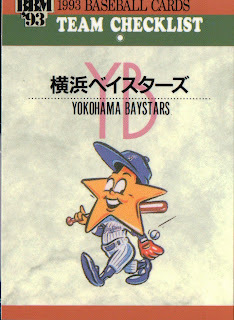 The "Nostalgic Stars" subset features players from the 1970's and 1980's. They are Michiyo Arito, Taira Fujita, Yutaka Fukumoto, Masaji Hiramatsu, Senichi Hoshino, Choji Murata, Katuo Ohsugi, Koichi Tabuchi, Shigeru Takada and Hisashi Yamada. Instead of having a "Combination Card" for each team like they did in 1992, the 1993 set only has five of these cards altogether. Two of them are for the Tigers and then one each for the Swallows, Marines and Giants. 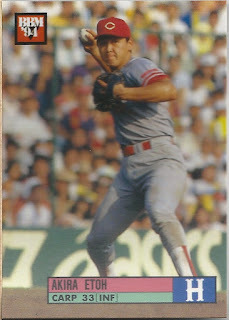 The cards don't have names like "Young Tigers" like the 1992 cards did either. 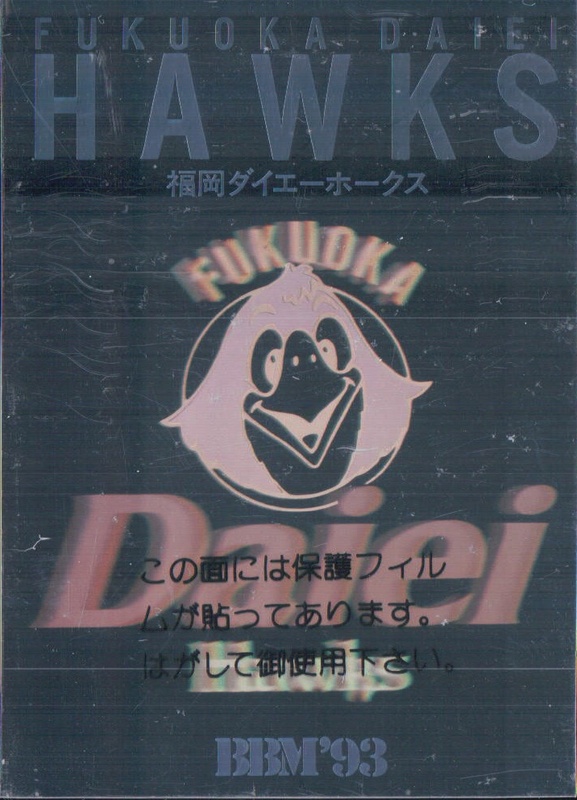 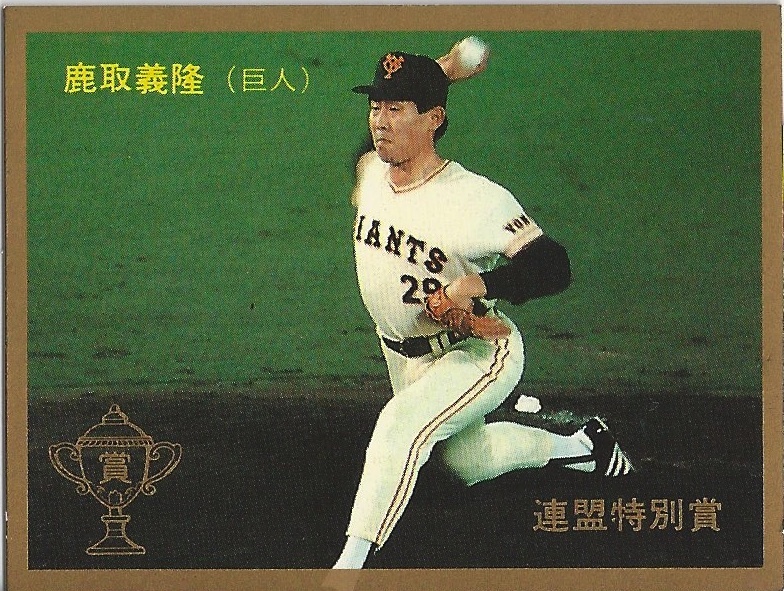 The four "Murakami Memories" cards depict Masanori Murakami with each of his four teams - the Nankai Hawks, the San Francisco Giants, the Hanshin Tigers and the Nippon Ham Fighters. 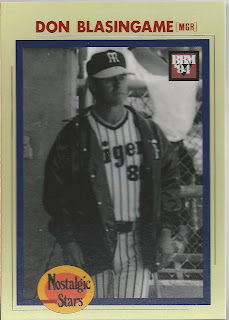 I believe that this is the only BBM card that depicts someone in an MLB uniform, but I could be wrong. 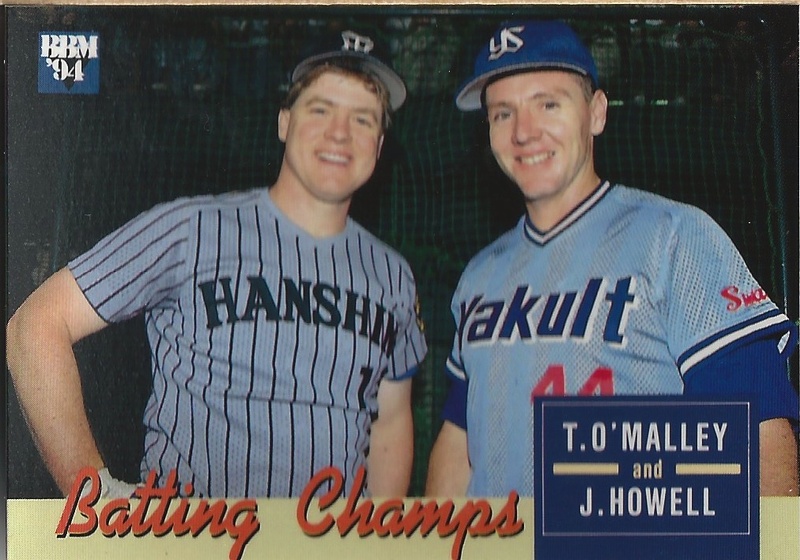 The 1993 set might not have a lot of notable rookies, but it makes up for that by having by far the two biggest ones - Ichiro and Hideki Matsui. 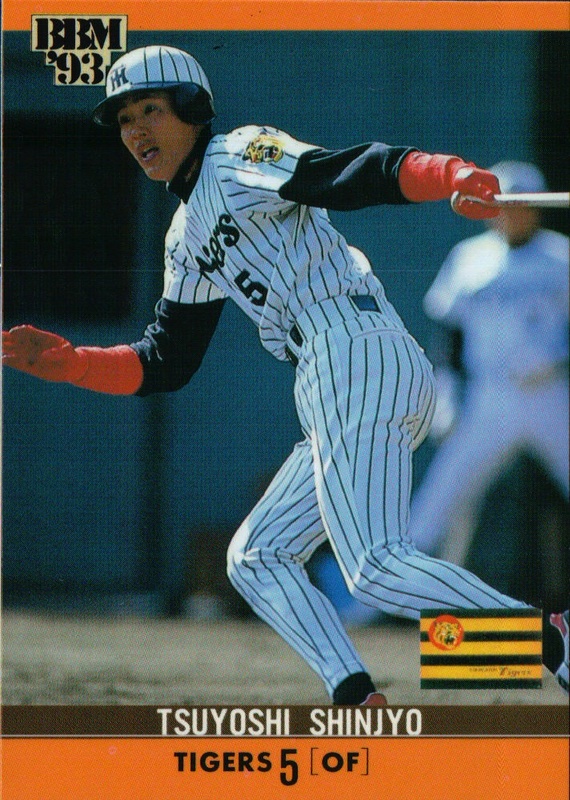 Both Takuro Ishii and Tsuyoshi Shinjyo appeared in the 1992 Calbee set (and Shinjyo is on one of the Tigers "Combination Cards"). 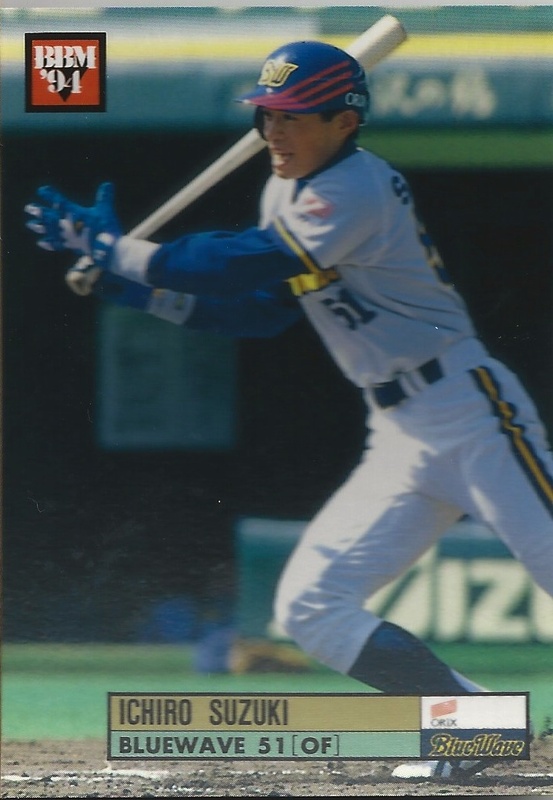 In fact, of the six five guys I have listed as significant, only Matsui and Noguchi's cards are actually marked as "Rookie". 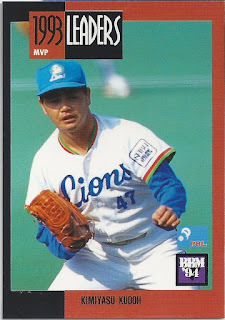 UPDATE: After doing a little research on Takeshi Yamasaki last week, I realized that his first BBM card was also in the 1993 set. I've updated the post to reflect this. UPDATE AGAIN: After doing a little MORE research on Takeshi Yamasaki, I need to correct the correction. Yamasaki's first BBM card was in the 1991 set, but his last name was spelled "Yamazaki" so my database had him in the wrong spot. 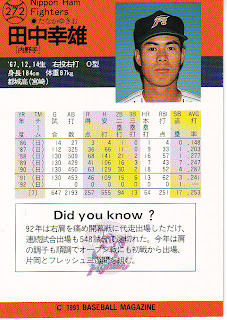 The first card with his name spelled "Yamasaki" was his 1993 card. 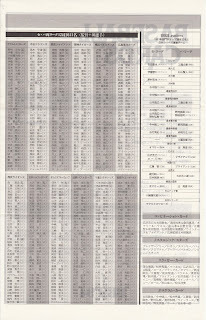 I've re-updated the post.